Derek and Keely Stutz of Simply Clean Cleaning Company, LLC, 1237 22nd St. Bedford, IN, are please to announce an addition to the existing property. We are having a new building erected in addition to our current office space, and it is set to begin construction in late September or early October. Graber Buildings out of Montgomery has been selected to construct the building, and CDA Mechanical from Bedford will be handling all of the plumbing, electrical, and HVAC. The new addition will be a 2,600 sq/ft. metal building equipped with floor drainage, bathroom, showers, additional washer/dryer stations, utility closet, heating, and 4 large roll-up doors. The main level will mainly be used to house company vehicles and supplies. A mezzanine/second floor location will be used for equipment storage as well as have real-world water damage training labs and equipment testing areas. BEDFORD — Derek and Keely Stutz of Simply Clean have received the Bedford Board of Zoning Appeals OK to expand their business past standard setback lines. The business is at 1237 22nd St. The plan submitted to the BZA shows an addition running from the current building to the east and north. The back would be parallel to a no-longer-used railroad line. Stutz sought a seven-foot setback, rather than the standard 15-foot setback, between the proposed building and the railroad property. Putting the building in that configuration will cost more, he said, but it will have the least impact on his neighbor, John Gould’s car lot. “It’s well thought-out,” Matt Painter of the BZA said at the end of the discussion. In the end, Painter joined Bill McFadden and Steve Kimbley in voting to allow the variance. The other two members, Byron Buker and Doug Kellams, abstained. Buker said he owns property nearby, and Kellams said Stutz sought advice from his business in drawing up the plans. After the vote, Stutz said he also has learned of another available building that might suit Simply Cleans’ storage needs. He might buy that building rather than build the addition, he said. “One or the other is going to have to happen by fall,” he said. "Simply Clean Technician Awarded Highest Level of Certification through IICRC." What is the IICRC? The Institute of Inspection Cleaning and Restoration Certification has served as the Industry Guardian for the cleaning, inspection and restoration service industries for more than 30 years. As a non-profit certification organization, the IICRC helps ensure that you have access to trusted and trained cleaning professionals by establishing and monitoring certification programs and standards for these industries. 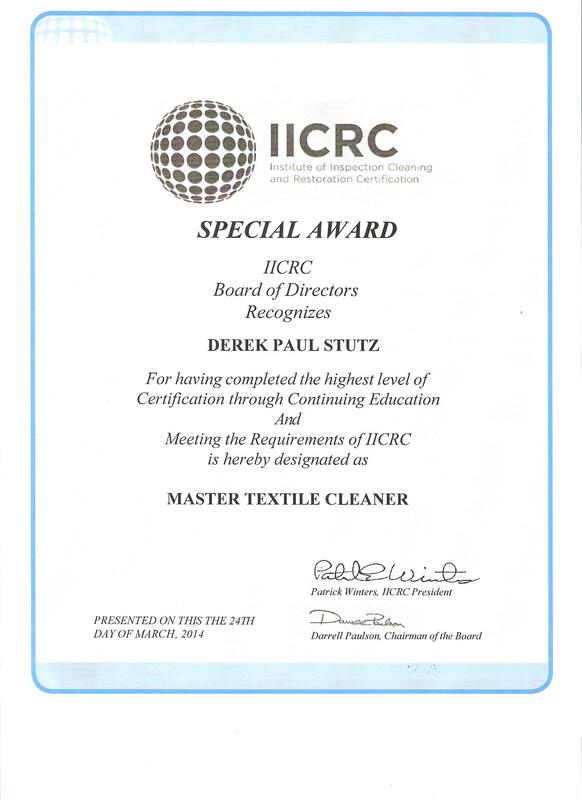 The IICRC has awarded Derek Stutz as “Master Textile Cleaner,” the highest certification in the area of cleaning, This certification comes with many hours of class room time, traveling, and commitment to attain. The IICRC has also certified Simply Clean technician Chris Duke in the areas of Carpet Cleaning, Water Restoration, and Applied Structural Drying. Congratulations Chris on continuing education with the IICRC and Simply Clean! "Simply Clean's Chris Duke furthers industry training." Chris Duke, a 4 year associate of Simply Clean has completed Carpet Cleaning, and most recently Water Restoration, and Applied Structural Drying training through the Hydrolab of Noblesville, an IICRC approved school. Congratulations Chris on continuing education with the IICRC and Simply Clean!